When you kayak on Lake Michigan, the rules of the road don't count for much. The law of tonnage trumps all. Big boats have the right of way, and little boats stay out of the way. And yet, we have our friends. The other day, we were paddling near Burnham Harbor, scouting launch sites for the upcoming Burnham to Marquette Sea Kayak Expedition and enjoying pretty much having the lake to ourselves, when we noticed a large white powerboat slowly heading right for us. 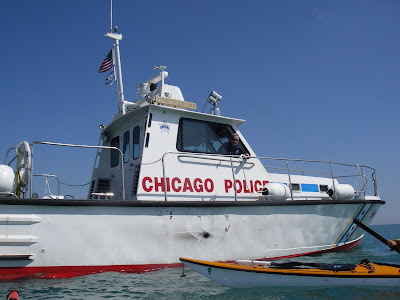 Soon we realized it was a Chicago Police Department boat, and its captain wanted to talk to us. So we paddled toward it. If you haven't yet had the pleasure of talking with any of the police officers in the CPD Marine and Helicopter Unit, you might not know that these guys are among the friendliest, most helpful cops in the city. They tend to be long-time mariners with a healthy love and respect for Lake Michigan and a serious dedication to keeping people safe on the water. The captain, Roger, immediately recognized that we were capable of taking care of ourselves, so we chatted awhile. "I have to confess, 10 years ago I thought you kayakers were crazy going out here in those little boats," he said. "But now I'm thinking about buying one and joining you." So we gave him some local paddling resources, told him we'd be happy to kayak with him, and went our separate ways. We've had several similarly positive enounters over the years with the police and Coast Guard. These guys see plenty of drunk powerboaters and oblivious jet skiers. We think they're relieved when they see knowledgable sailors and kayakers who clearly know what they're doing and how to keep from getting in trouble. That's a reputation we want to make sure that our paddling community upholds. We have access issues on the lake, too. There is a limited number of put-in and take-out sites on the Chicago shoreline between Memorial Day and Labor Day. There can be heavy boat traffic on the lake and on the Chicago River on warm summer days. Because we are small and human-powered, we rely on good relationships with the authorities when we want to go through the lock between the lake and the river or organize an event like the upcoming Burnham to Marquette expedition. We need to cultivate and maintain these relationships by being responsible and responsive. That's why we value encounters like the one with Roger and look forward to seeing him in a much smaller boat some day. It must be for paddling. Here's something we have in common with salmon: We've been in all kinds of wonderful water, but every year we return to the tiny little pool where our love for paddling hatched. OK, we stretched that metaphor to death. 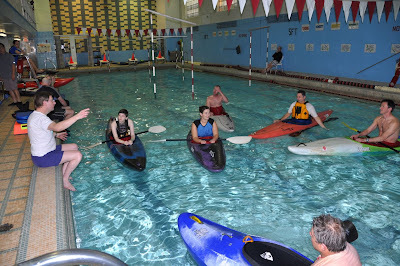 But how else can you explain our affection for the dinky little pool where the Chicago Whitewater Association (CWA) teaches 10-week classes every winter and spring? We began as students about seven years ago. That's where we learned to roll and to control our boats. We gradually became assistants, helping set up gates and move gear. 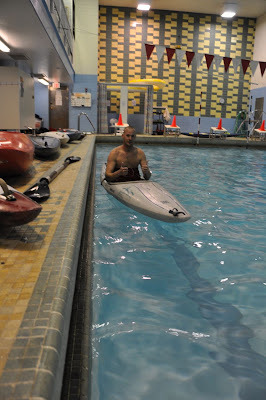 Now we're able to teach rolling and strokes to a new cohort of kayak enthusiasts and help on the club's teaching trips every spring on the DuPage, Vermillion and Wolf Rivers. 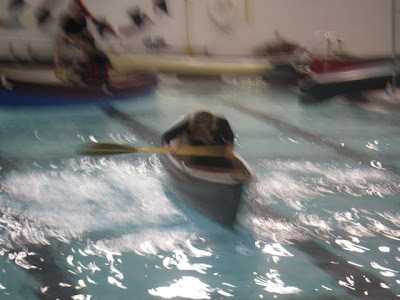 Last night was the final spring pool class in Oak Park--the night of the slalom, in which students are challenged to run through a series of gates, sometimes forward and sometimes backwards, as a test of their new-found paddling skills. John Karch explains the slalom rules: Run all the gates once--some forwards, some backwards-- and do a roll or a 360-degree spin at the end before repeating the course once more. Each time you hit a gate, five seconds are added to your time. People get very nervous, but they're also very supportive of one another. There's a lot of cheering when someone clears a gate, and groaning when they tap one with their boat or paddle. Bret manages to clear a gate, using his kayak limbo skills. After the instructors run the course, we take down the gates, haul out the boats and go out for pizza. We'll see one another again in a few weeks, when we embark on the first of the river trips. Mike gives the slalom race two thumbs up. Next stop: actual moving water! A cluster of canoe paddles beckons wandering canoeists and wayward kayakers. Forget groundhogs and crocuses. 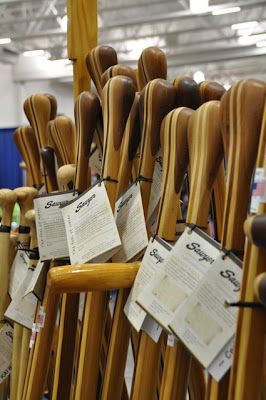 The first sign of spring for midwestern paddlers is Canoecopia, the annual paddlesports expo sponsored by Madison-based Rutabaga. Canoecopia is more than a trade show. Sure, it features the expected vendor booths where visitors can try out and try on the latest and greatest gear, from boats and paddles to PFDs, watches, dry bags, wet suits, shoes, camping gear, cooking gear, safety gear and more. They can also browse a comprehensive selection of books and DVDs, and get information from outfitters and resorts, clubs and organizations, camps and magazines. In other words, anyone looking for anything related to paddlesports would find it here. 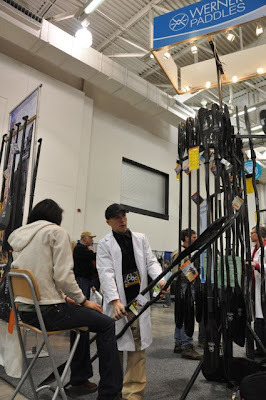 Dr. Danny Mongno, paddle authority extraordinaire, at the Werner Paddle booth. But there's more to Canoecopia than that. Every hour, there are at least six simultaneous sessions where visitors can learn about paddling expeditions and destinations, get tips about nature photography and backwoods camping, and hear some of the top instructors explain their techniques. Ben Lowry demonstrates rolling on dry land prior to a session in the pool. But honestly, there's more to it than that, too. For us, Canoecopia is also a chance to connect. We spend part of our time in the hallway, where numerous clubs have tables, talking to passers-by about what our clubs are offering. This year, we were ostensibly representing CASKA (the Chicago Area Sea Kayakers Association) but also promoting the new NWIPA (Northwest Indiana Paddling Association), and encouraging attendance at the upcoming Paddlesports Festival in Aurora, the Chicago Shoreline Marathon, the new Burnham to Marquette Sea Kayak Expedition, and more. 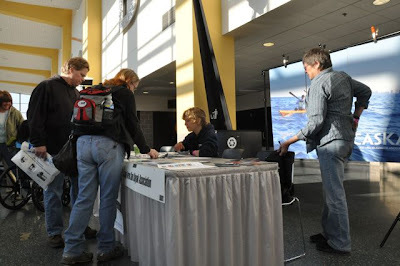 At the CASKA booth, Sharon extolls the opportunities to paddle in the Chicago area. 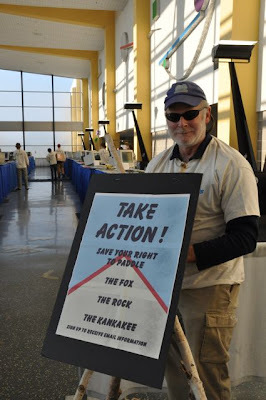 Tom Lindblade, president of the Illinois Paddling Council, encourages people to lobby against proposed legislation that would restrict access to Illinois waterways. 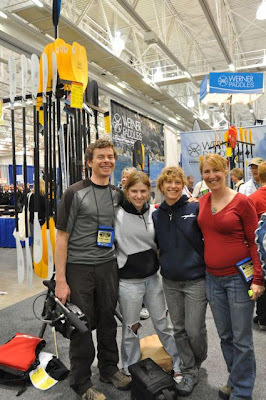 In addition to reconnecting with old friends -- Danny Mongno of Werner Paddles, Kelly Blades of P&H Kayaks, Derrick Mayoleth of Kayak Quixotica, Damon and Sarah Smith of Riverside Kayak Connection and more -- we're always excited to meet new ones. This year, we had the privilege of seeing the premiere of Bryan Smith's new film, Eastern Horizons, and meeting him and his wife, Lise-Anne (who are four months away from bringing a new paddler into the world). A dry moment caught on camera. Ultimately, for us paddling is much more than a water-based sport. It's a community, and we thank Rutabaga for helping us reconnect every spring. Sharon completes a low brace recovery. 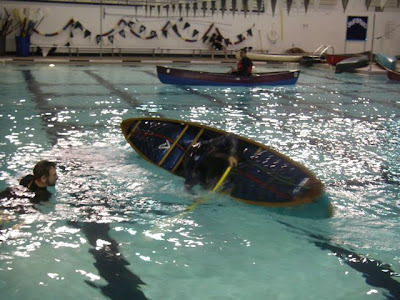 This is week three of the solo canoe class. It's strange and wonderful to be a student again. We experience every lesson on two levels: as students learning new skills, and as instructors fascinated by how other instructors teach. 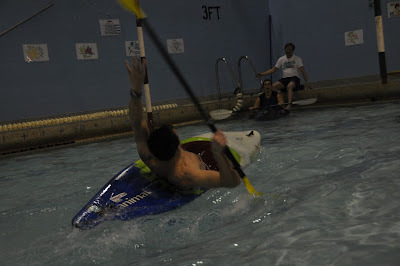 Our paddling skills do and don't translate. Many of the strokes are familiar but different. Our draw strokes are almost identical, but the canoe pry has no counterpart in the kayak repertoire. The low brace is pretty similar, but the canoe high brace is an act of faith compared to the high brace recovery stroke we do in a kayak (the end of a roll). Open boats sink much more quickly than kayaks containing flotation or bulkheads. And yet the strategies for assisted rescues are quite similar. The canoe folks just discovered the fabulous heel-hook reentry that sea kayakers began using a couple of years ago. Stick around in any paddle sport and you'll witness techniques evolve. 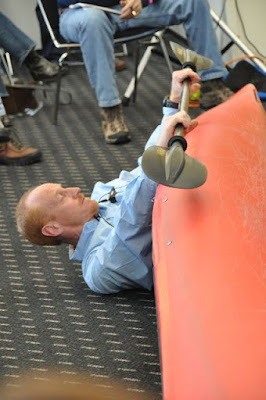 As we learned the high brace, IT (Instructor Trainer) Tom Lindblade noted that the ACA (American Canoe Association) has recently begun recommending a pry stroke instead. We're enjoying watching another discipline's instructors adopt and teach techniques that change over time. Alec attempts to roll a canoe.